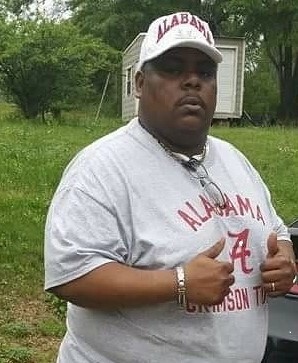 The late Deacon Morris Augustus Carter also known to all who knew him as “Gus” and “Big Daddy” was born on October 21, 1972 to the late Mr. Jimmy and Shirley Marie Carter in Wilcox County, Alabama. Morris accepted Christ at an early age and jointed the New Virgin Baptist Church in Pine Apple, Alabama. He later moved his membership to the Providence Baptist Church in Marion, Alabama under the leadership of the late Reverend Clifford Coleman where he was ordained a deacon. Morris was united in holy matrimony to Pamela Denise Luckey to this union no children were born. Morris loved his family and his church family. He especially loved and was a big fan of the Alabama Crimson Tide, The Dallas Cowboys, and the Los Angeles Lakers. Morris came from a big family and will never be forgotten and will be cherished by his wife Pamela Luckey Carter of Marion, Al. His mother and father in law Amzie and Eva Luckey Sr. of Marion, Al. Three sisters Teresa, Loresa, and Veronica Carter of Selma, Al. One God Sister Mary (Solomon) Smith of Prattville, Alabama. One brother Keith Carter of Selma, Alabama. Three God brothers Markeise (Marquita) Brooks of Tuscaloosa, Alabama. Tyrone (LaSheena) Grace of Birmingham, Alabama, and J.B. Moultrie of Selma, Alabama. Three sisters in law Alice Luckey Riggins, Susie Luckey of Cleveland, Ohio, and Ayne Luckey of Newnan, Georgia. Three brothers in law Vincent Luckey of Cleveland, Ohio, Anthony (Bonita) Luckey of Toledo, Ohio, and Amzie (Betty) Luckey Jr. of Brent, Alabama. Five aunts and their spouses, four uncles and their spouses. A special cousin Kathy Carter of Pensacola, Florida. A host of nieces, nephews, cousins, relatives and friends.